The Illinois Soybean Association (ISA) is a statewide organization that strives to enable Illinois soybean producers to be the most knowledgeable and profitable soybean producers in the world. The Illinois Soybean Board, through the soybean checkoff, funds market development, soybean production and profitability research, promotion, issues management and analysis, communications and education. Illinois Soybean Growers manages membership and advocacy efforts that support Illinois soybean grower interests in local areas, Springfield and Washington, D.C.
Illinois is a leader in soybean production with a huge economic impact. 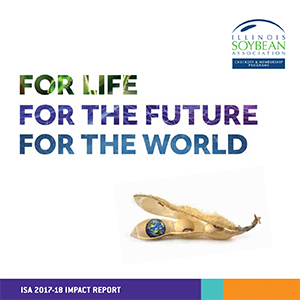 Illinois soybeans provide a global food supply, feed for animals, sustainable biodiesel and more. Find out more about Illinois soy in this 2018 Fact Sheet. Profitability is ISA's priority. But how we approach that has changed as the world around us changes. We are embracing bold ideas to set Illinois producers apart.